In his younger days, Dan was a keen hunter and regarded wildlife mostly as game animals. Joan is always looking up the names of plants or birds in books and is now a good botanist and birder. There was a time when wildlife were thought of only as game animals, or animals to be hunted. In the early 1970s when Carl started with the Nova Scotia Department of Natural Resources, the Wildlife Division of the department was concerned primarily with waterfowl, moose, deer, bear, upland game, and furbearers. Although scientists and naturalists at universities and at the Nova Scotia Museum of Natural History studied "non-game" wildlife in an academic sense, "non-game" wildlife had no legal protection and were mostly ignored. Economic development proceeded without concern for wildlife that did not earn their importance as sport animals. A Wildlife Policy for Canada (1990) has redefined wildlife to mean "all wildlife: wild mammals, birds, reptiles, amphibians, fishes, invertebrates, plants, fungi, algae, bacteria, and other wild organisms." Scientists have documented or named 1.7 million species of plants, animals, bacteria, and fungi worldwide and estimate many millions more (perhaps 14 million) currently unnamed. It is difficult to think of bacteria in the same way as a bald eagle. But a conversation with persons that study small organisms would explain how important, for both good and bad, these small micro-organisms are in our lives. Fortunately today´s society has a broader appreciation for wildlife and is realizing the affects that humans have in disrupting life systems. The Wildlife Division now has expanded to include a program devoted to Biodiversity and to Species at Risk. Also there is a Forest Habitat program that integrates wildlife conservation methods with forest management. BIODIVERSITY includes all forms of life as well as the different levels at which life—trees and other plants, invertebrate and vertebrate animals, fungi, and microorganisms—operates, from genetic differences among individuals to complex interactions within ecosystems. The term biodiversity encompasses both biological “structures” (genes, organisms, populations, or communities) and biological “processes” (energy transfer, nutrient cycling, and succession). The complexity of wildlife becomes more impressive when one considers wildlife in terms of biodiversity. Within each individual species there is genetic variation. For example, because of geographic separation over many years, a population of brook trout in Annapolis County in western Nova Scotia will vary genetically from brook trout on the Cobequid Hills in Colchester County and will vary even more from brook trout in Newfoundland. This genetic variation gives living things the potential to adapt and thus survive changes in their environment. Biodiversity also importantly looks at species in the context of ecological relationships. The ecological importance of wildlife is explained in the next section. Woodlot owners know how lucky they are to own woodland. 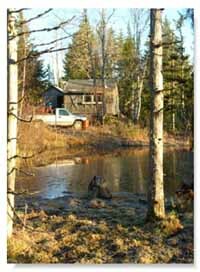 Many owners have built camps on their woodlots. Joan teases Dan that his camp is where he goes away to pout, although she, herself, greatly enjoys the quiet there. By “going to the woodlot” they get outdoors and away from concrete, artificial light, and noise to renew their spirit. Wildlife is an important part of that experience. Each walk through the woodlot differs with the changes in the seasons. Ostrich ferns along a rich river interval change from springtime fiddleheads to metre-high summer fronds. Joan and Dan watch cedar waxwings eat springtime apple blossoms and find bear droppings under apple trees in the fall. During the class Carl teases Dan that with the name Barr, he is related to the bears that visit his woodlot. The recreational importance of wildlife is supported by an Environment Canada report that found in the one year, 1996, 630,000 Nova Scotians spent 65.8 million days in direct and indirect wildlife-related activities such as viewing, hunting, fishing, or visiting natural areas. Another example of wildlife recreation, in 2005, 1240 observers participated in 35 Christmas Bird Counts in different communities across Nova Scotia. The same Environment Canada report found that again in the year 1996, Nova Scotians spent 244.8 million dollars on wildlife-related activities. Tourists come to Nova Scotia to see our spectacular landscapes and our wildlife. Guides, taxidermists, trappers, and birdseed suppliers earn money from wildlife. Certainly the greatest importance of wildlife and biodiversity is ecological. Each woodlot parcel in Nova Scotia contributes to an ecosphere of life that surrounds our planet. The ecosphere provides essential services for our survival. It cleans the air we breathe, recycles and purifies water, absorbs waste we produce, provides us with food, fuel, and shelter, and stabilizes and moderates climate. Green plants produce oxygen and remove carbon dioxide. Fungi and bacteria decompose the dead and recycle nutrients back for the living. At the genetic level, variety stored in genes gives organisms the ability to adapt to changes in the environment, such as climatic change or disease. Forest communities that are simplified with reduced genetic diversity lose adaptability or resiliency. Many common medicines, such as the heart medicine digitalis, come from nature. As far back as 1785, an extract from foxglove (Digitalis purpurea) was prescribed for treating irregular heart rhythm. There are many more examples and great potential for future discoveries. Some researchers are looking at why the skin of tropical frogs has such high resistance to infection. Medical researchers connected to space travel are studying black bears to determine how they can hibernate and not have tissue or bone damage. Sometimes we may think that certain species have no value. The truth is that the real contribution or ecological importance of an unappreciated species has not yet been discovered. It is important to remember that species and ecosystems have evolved over thousands of years, and most occurred here before the arrival of humans. They all have intrinsic value. Unintelligent tinkering and the loss of one species could put the survival of many other dependent species at risk. Mycorrhizal fungi form a partnership with trees and most other plants by intertwining with the roots of plants. These beneficial fungi are filamentous themselves and serve as a secondary root system. They extend far out into the soil and extract nutrients, such as nitrogen and phosphorous, and water for their host plant. In return, the plant supplies carbohydrates to the fungi. This partnership is believed to have evolved early in the evolution of plants and enabled plants to survive in stressful locations where nutrients were scarce. A third organism enters the relationship at night. Flying squirrels emerge from daytime hiding places in tree cavities to dig up mushrooms and truffles. The squirrels, in turn, spread fungal spores in their droppings. Even the maligned porcupine has a role. Imagine a porcupine inadvertently dropping branches down to a starving deer or creating openings in the forest canopy allowing sunlight to penetrate to the forest floor. All living things require food and water. Living things also require shelter for protection from climate or from dangers such as predators. The foods eaten, the use of water, and how and where wildlife seeks cover can take many forms. Also the availability of food, water, and cover must be relatively accessible, within the limits of the species daily or seasonal mobility. Carl explains wildlife habitat as having four parts—food, water, cover, and spatial relationships. The study of nature is so interesting because each species has diverse physical and behavioral adaptations to claim their share of food, water, cover, and space. Food provides the energy for a species to grow, for body maintenance, and for reproduction. When one considers that a hen black duck with a clutch of 12 eggs has laid her own weight in eggs, the investment in energy for reproduction is considerable. A female green frog will lay 1000 to 5000 eggs. A male green frog will spend weeks calling in his “loose banjo string” like call, defending a favorite spawning site. Carl believes that one of the most amazing and probably the least appreciated process in nature is photosynthesis. To understand the strategies of all organisms for obtaining food, it is important to know that all food is initially the result of photosynthesis. Plants, energized by sunlight, are able to convert minerals into carbohydrates, fats, and proteins. Photosynthesis is the beginning of the amazing journey of energy and basic materials of life from plant to animal to decomposer. The energy stored by plants is passed to other species by a series of steps of eating and being eaten. Plants are the primary producers. Herbivores are the plant feeders, capable of converting energy stored in plant tissue to animal tissue. Insects, rodents, and hoofed animals are examples of herbivores. Herbivores have adaptations, such as the structure of their teeth, complicated stomachs, and long intestines, to eat diets high in cellulose. Herbivores in turn are the energy source for the carnivores, adapted for a diet of flesh. Carnivores themselves are eaten by larger carnivores. Carnivores have evolved specialized body parts that help them capture and consume their prey. Hawks and owls have sharp talons for holding prey and hooked beaks for tearing flesh. Mammalian carnivores have canine teeth for biting and piercing. Some consumers are omnivores, eating both plant and animal matter. A red fox will feed on berries, small rodents, and even dead animals. Decomposers make up the final feeding group. Bacteria, yeast, and fungi are a large part of this group. They break down the remains and wastes of others into simpler substances and eventually into inorganic minerals, making them available again for use by photosynthetic plants. Most wildlife species must consume water daily. For most terrestrial woodlot wildlife in Nova Scotia, water is readily available and rarely a limiting factor. (In a desert environment, water is a limiting factor.) However the life strategies of aquatic species, such as beaver or frogs, are more critically linked to water bodies. A woodlot without permanent water will not have the larger bullfrog or green frog species, because the tadpoles of these frogs must over-winter in water. These big tadpoles, with hind legs developing, are often seen along lake or pond shores. Cover provides an animal with protection from the weather and from predators. Deer, during winters of deep snow, will “yard” in mature softwood stands, because falling snow is caught on the boughs in the tree canopy and deer mobility on the forest floor is easier. The same trees provide protection from wind. As will be explained further in later lessons, cavities in trees and spaces within logs are cover for numerous species for dens, nests, resting, and escape. Abundant food, quality cover, and water must be inter-mixed and available over the space for which the species has an ability to travel. Habitat would be poor if, for example, a snowshoe hare had to travel a long distance between places where they hide and places to feed. It would be a fast food takeout in reverse with predators waiting for food to drive by. A beaver pond would not stay occupied if aspen trees and other foods were not available within a short carry distance of the pond. A beaver pair locates all their life needs along a section of watercourse. They create an area of deep water by building a dam, create a lodge within the pond, and find necessary foods within the pond and along its borders. If food becomes scarce, they move up or down stream and create more dams and a new lodge. In their second year, young beaver born to the adult pair are forced to disperse—to find mates and new pond opportunities elsewhere. Serious fights result if dispersed young or other beaver attempt to live within the occupied territory. The space and arrangement over which an organism obtains food, water, and cover varies in size for different species. Space for a plant might cover 1.0 square metre, as far as the plant’s roots or limbs and leaves reach. The yearly movements of a moose could range over 10 square kilometres. To maintain wildlife on a woodlot it is important to have an inter-dispersion of forest types and other aquatic and non-forest habitat types. Nova Scotia has over 1700 species of plants. The physical appearances of these Nova Scotia plants are often very different. Over evolutionary time the shapes of plants have evolved in divergent ways, resulting in diverse structural survival advantages. Like animals, plants need space, water, and food in the form of minerals. Like animals, plants need cover or at least the protected conditions where they are not killed by climatic extremes. Unlike animals, the majority of plants need sunlight for photosynthesis. Saprophytes are an exception among plants. Saprophytes, such as the white-coloured Indian pipe, have lost the ability for photosynthesis. Like scavengers, they draw nourishment from dead plant and animal material. Each plant species competes with other plants for space, water, food, and sunlight. One strategy is to grow tall above all other plants. Trees are the giants of the plant world. Smaller plants have adapted by growing away from the trees or have adapted to live with them. Tough plants like cord grasses grow in salt marshes where trees cannot grow and are able to withstand daily submersions in salt water. Heath plants grow in bogs or on rocks where tree growth is poor. Insectivorous plants, such as the pitcher plant and sundew, live in bogs and supplement their need for nitrogen by catching insects. Cattails and water lilies grow out of the shadow of trees in wetlands. Some plants, like northern beech fern, are shade tolerant and able to grow under the trees. Trout lilies and spring beauty do grow on the forest floor under hardwoods. In May before hardwood leaves open, these vernal plants have a flash of growth and blossom in the warm sunlight before the tree canopy closes. Some plants, such as fireweed and goldenrod, are pioneer species growing in forest openings. They produce thousands of airborne seeds that seek out new openings. The location where a plant or an animal finds the perfect conditions for its genetic strategy to survive is called its niche. Following plants in the food chain, the herbivores, carnivores, and decomposers compete with types of their own and elbow into a niche somewhat different than their closest competitor. Barred owls, for example, will hunt at night, while northern goshawks hunt in the day. American goldfinches feed regurgitated seeds to their young, unlike many other birds that feed insects to young. Everyone has noticed year-to-year fluctuations in numbers of wildlife. Wildlife populations change in response to factors such as diseases, predation, weather extremes, exploitation, and habitat conditions. At times, two or more mortality factors will function together to decrease a population. For example, deer weakened by starvation becomes more prone to predation or death from cold weather. In nature, birth rates attempt to replace numbers lost to mortality factors. One of nature’s survival strategies is to produce many offspring, calculating that a few will survive to reproduce the next generation. By far the most important remedy for high mortality is habitat condition. When a population is severely reduced, recovery is usually assured if good habitat exists in which populations can grow. Also in good habitat there is more stability and more resistance to wide population fluctuations. Habitat is the ultimate limiting factor. In good habitat, wildlife have better food and cover and are in better physical condition to withstand disease and climate extremes. There is better survival of young.